The revolution of e-books can’t come soon enough for me. 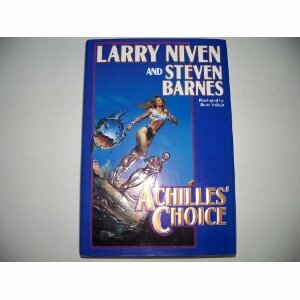 There is a great SF book called Achilles’ Choice that I recently pulled off my shelf, intending to use it in a blog posting, but when I searched B&N to link to it, I found it was out of print! Sadly, Larry Niven and Steven Barnes’ awesome little 1991 tome is unavailable, except through “special sellers.” This shocked me, and gave me pause to think about how short a book’s lifetime can be. It also reminded me of JA Konrath’s excellent blog posting, Am I Good Enough to E-Publish? where he strongly encourages out-of-print authors to e-publish their books. Not only is this a boon to authors, it is a fantastic way for readers to access books they normally would have to scrounge through garage sales or second hand book stores to find. And it appeals to my inner free-marketeer as well. Which made me think of Tom Swift! I am a HUGE fan of these tech-boy-genius books but they are all out-of-print and horribly difficult to find (and pricey if you do). I am sure I could interest Mighty Might and Worm Burner in them, especially if I had them downloaded onto my nook. Even Dark Omen might be intrigued to download the ones he doesn’t have, to round out his collection for old time’s sake. So, please, please, PLEASE, publishers of the Tom Swift books (I’m looking at you, Simon&Shuster! ), will you PLEASE get with the e-revolution and make these books available for download? My kids will thank you. I remember searching near and far for an OOP book (Duncton Wood). Found it (used via internet, I believe, somewhere in England) and discovered it was a series — one of my favorites — having all books in e-book format would be outstanding. I'm sure Google would be willing to help out. Google rocks for making non-copyrighted books available, but I want to pay the authors for their works. But you're right – if the publishers don't hop on this, the authors, Amazon, Google or someone is going to swoop in and scoop up the cash.